Thanks for your great quilt pattern! I am recommending it to all my friends - both inexperienced and experts. 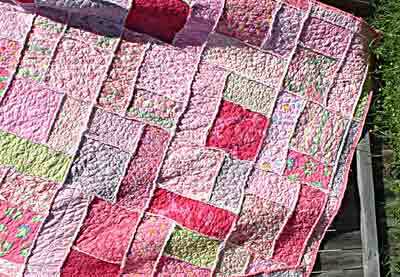 This is my "Think Pink" quilt". With a quilt this size (or larger), I don't like having to bunch it up in the machine to quilt it, so I quilted as I went, and made this a scrappy quilt. I cut as per your directions top and bottom (flannel bottom), and cut batting in pieces, but 1" smaller. I sewed 1/2" seam allowance and left all raw edges on top. I think this is a comfy, scrappy, funky looking alternative to your quilt!